The folly of gun control in a single picture. Pictured above is the most expensive AR-15 I have in my possession, but also the most interesting. 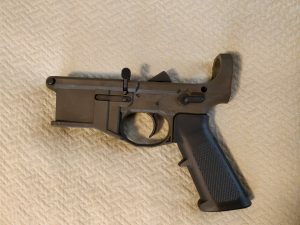 It’s a Polymer80 80% lower receiver which, when purchased, is a completely unregulated piece of plastic costing $80, and which includes a one-time disposable plastic jig for making the proper cuts and holes in the correct locations, as well as the drill bits and end mill needed to make those holes. The package also included various parts that are relevant to a few non-standard aspects of the receiver, such as a square nut and screw that holds the grip on rather than the regular screw which threads directly into an aluminum receiver, and a threaded set screw instead of a roll pin for the bolt catch lever — roll pins and polymer receivers don’t really work too well. In addition to the $80 for the receiver kit itself, I spent $70 for a Wen 4208 8″ drill press, $60 for a Wen 4″ cross-slide vise, $7.47 for an extra long 5/16″ end mill to drill out the trigger hole was worthwhile since it made a much nicer and cleaner hole than the 5/16″ drill bit that came with the kit. $68.75 for a standard AR-15 lower parts kit, conveniently available from Polymer80 as well, was also purchased. I also spent a few bucks for some bolts, nuts, and washers from the local hardware store, bringing the total cost to about $310, and that’s without the buffer tube and stock assembly or upper. Yikes. The vise is slightly too tall to hold the jig on the press’ table while doing work, so I ended up bolting it to the base of the press using stacks of several washers (far from ideal and ugly, but functional) as spacers to lift the vise up to where the bit can reach it. I was able to complete the lower in a few hours by using the drill press to plunge the end mill into and remove much of the fire control pocket material, then lightly abuse the drill press as a poor-man’s mill and clean up the fire control pocket with the side of the end mill. I used a hand drill, as recommended, to drill out the holes on the sides. Some light filing and sanding cleaned up some rough spots, and it was good to go. Neglecting all the sunk costs on equipment, the polymer 80% lower is twice the cost of a forged aluminum $40 Anderson stripped lower. Why bother? It’s remarkably fun to build something with one’s hands. It demonstrates the folly of gun control. #1 should be obvious, but #2 is a nice touch. Other than the lower receiver, literally every part of the AR-15 is completely unregulated and can be purchased from a huge number of vendors, both in person and online. The 80% lower itself is, until completed, a totally unregulated piece of plastic. Once made, it’s considered a firearm, just like any other lower, so various rules apply to its ownership, transfer, or sale if one wanted to go that way. Short of restricting basic tools available at hardware stores and pieces of plastic, there’s no way to prevent someone from making their own. If one knows how to operate a basic hand drill, can watch a YouTube video, and follow basic step-by-step directions, they can make one too. It’s easy. So easy, in fact, that it neatly nullifies the concept of gun control as it applies to restrictions on manufacturing or transferring AR-15s. This gives me a warm and fuzzy feeling. Everyone should make at least one. It’s fun and helps promote liberty.